Lounging in your favorite chair out in your yard or patio as you drink a cold and refreshing soda on a beautiful day is one of life’s great moments. However, with the many joys of a prized garden and a decorated yard comes the need for regular cleaning and maintenance. Usually, a broom will not be enough for all that stubborn dirt, stains, bird poop, pine pollen, grime, and mold that settles into the nooks, crannies, and pores. 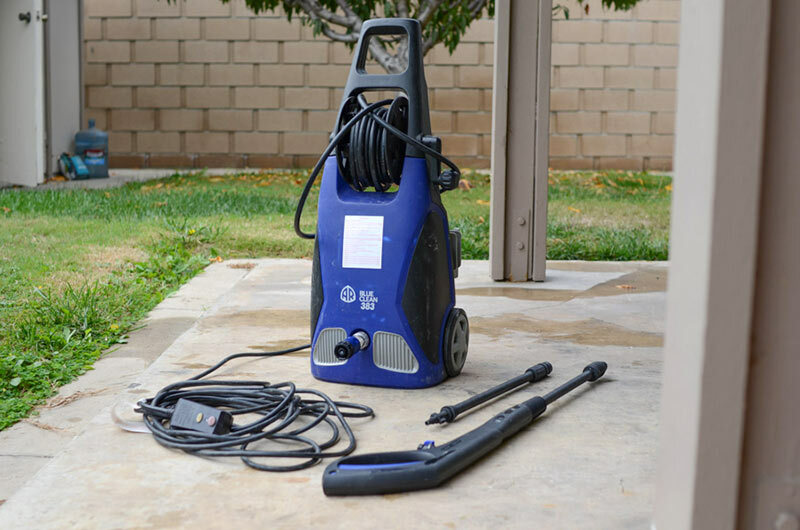 You’ll need the best electric pressure washer for all that debris and mildew build up on your concrete and wood surfaces, as well as other garden fixtures. Therefore, I’ve listed for you what I think are six of the best electric pressure washer! I’ve made sure to include pressure washers of different sizes, spray strengths, as well as spray features, so you’ll find the perfect product for your yard. Without getting too technical, let’s get into the basics on Electric Pressure washers and what you need to know. Armed with this info, you’ll be more confident as you look into the many pressure washer options on the market! Also, you’ll be able to find the perfect pressure washer for your garden, garage, yard, or patio needs! Why Can’T I Just Use My Garden Hose? The reason is this: pressure washing uses high-pressure spraying water which is several times stronger than your ordinary garden hose. This strong sprays will swiftly and efficiently remove grime, mildew, mold, stains and can also make wooden surfaces and decks look new again! 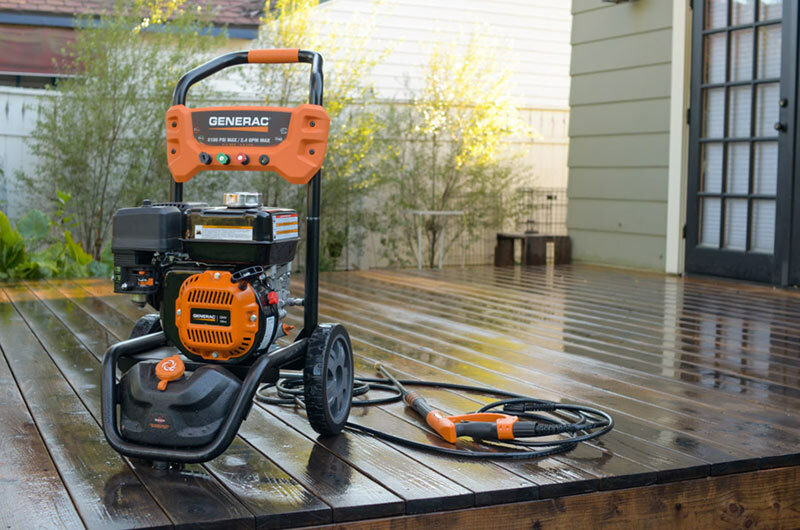 What Kind Of Pressure Washer Should I Get, Gas Or Electric? The choice between gas or electric pressure washers need not be difficult. Just keep in mind that these two kinds of pressure washers have their own pros and cons. Less powerful than gas-powered pressure washers. In other words, electric pressure washers can still handle heavy-duty tasks, albeit in a longer time. PSI stands for Pounds per Square Inch. In the context of pressure washing, PSI refers to the strength of the water pressure that the pump is pushing out. In electric pressure washers, you’ll generally find pressure ratings ranging from 1000 to 2000 PSI. If the pressure is too low, your washer will not be that different from the typical garden hose. GMP, on the other hand, stands for Gallons Per Minute which refers to the volume of water that is pushed out of the nozzle. When there’s too little GMP, the spray will be too fine for it to be effective at washing, in spite of its pressure. Cleaning Units, or CU, is important since it expresses simply the overall cleaning power of an electric pressure washer. You can get the Cleaning Units of a pressure washer by multiplying the PSI to the GMP. 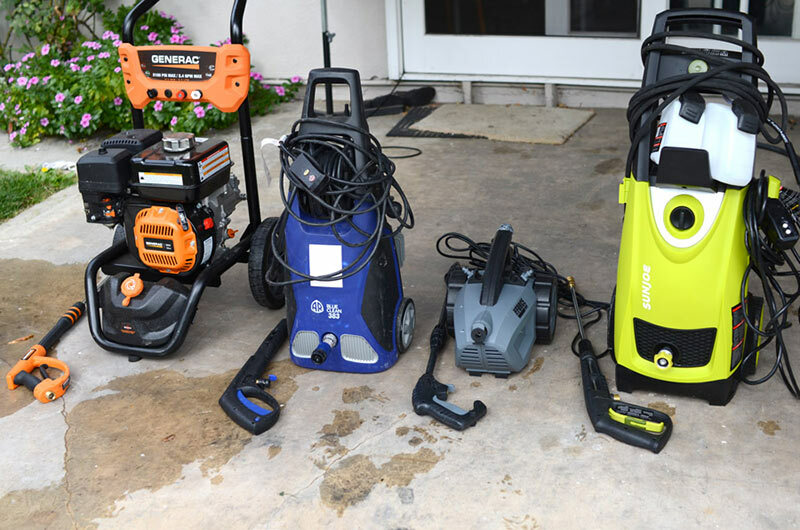 Although Cleaning Units will not necessarily determine the right product for you, it’ll help you get a good idea about the amount of work that the pressure washer can accomplish. 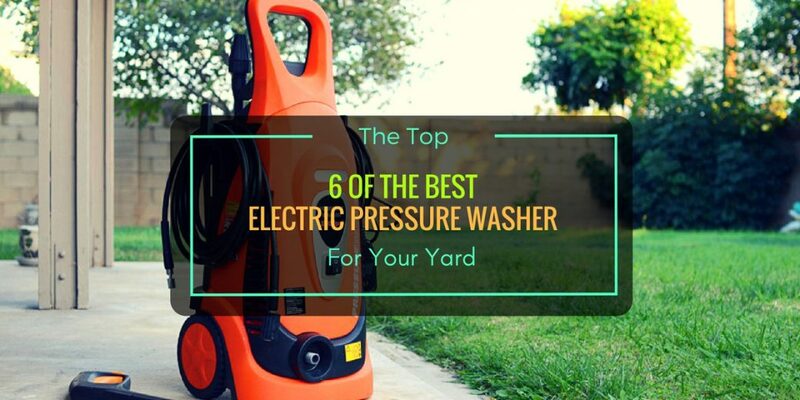 Now that we have a working understanding on electric pressure washers let’s take a look at some features you can consider when buying your next electric pressure washer. The spray attachments on pressure washers can either be in the form of nozzles or tips that you attach to the end of the spray wand or interchangeable wands or lances. These attachments will let you control the water’s pressure, and spray angle. For example, a 40-degree nozzle will spray out a fan of water, while a 0-degree attachment will give you a pinpoint and concentrated spray. Additionally, manufacturers design some attachments for use in conjunction with soaps and detergents. 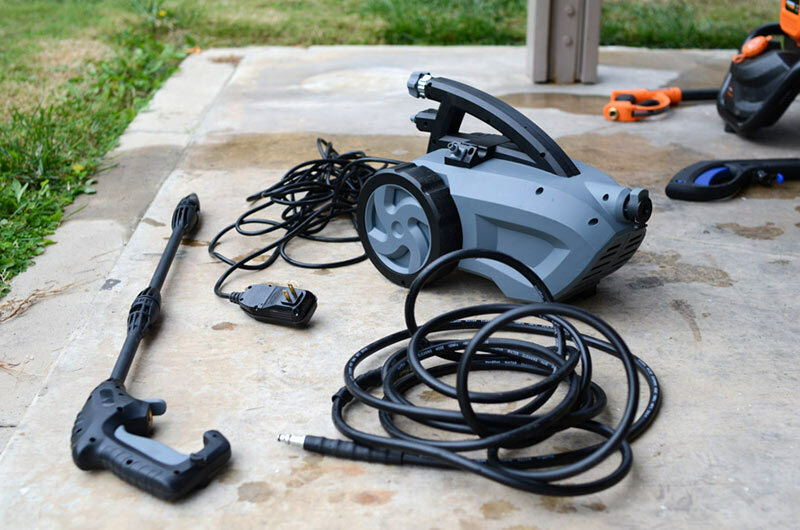 Cord storage may seem like a minor feature, but a pressure washer cord reel will quickly prove to be the easier product to use over pressure washers that only have a wire hook. Many pressure washers feature an auto stop system as soon as you lift your finger off the trigger. Again, it may seem like a small feature, but this auto stop system can save you up to 80% of water as well as electricity consumption! A handy feature to have on any pressure washer is the integrated soap or detergent tank. With this tool, there’s no need for you to bring or carry a separate container for your soap! Take care when handling a pressure washer at its highest pressure settings, especially when using the 0° nozzles/wands. The jets of water with these settings can be powerful enough to cause bodily harm or permanent damage to surfaces and plants. Hence, always follow manufacturer’s instructions, start with a low pressure / wide spray angle, and use the machine at least 2-feet away. Additionally, wearing protective gear, such as safety goggles, a facial mask, and robust work shoes will bring a lot of good. Starting off our list with full marks is the SPX3000 from the every reliable Sun Joe company. Featuring a 14.5 amp motor spraying out water at 2,030 PSI and 1.76 GPM, the SPX3000 is one of the most powerful and efficient pressure washers on our list! Adding to this efficiency is the versatility of 5 multi-colored nozzles that will give you varying spray angles. The first four nozzles will spray at 0°, 15°, 25°, and 40°. Meanwhile, manufacturers designed the fifth nozzle specifically for delivering soapy water. Hence, you’ll have just the right type of spray for the job, then the Total Stop System feature on the washer will ensure savings on energy, water consumption while prolonging the life of the pump. Speaking of soap, the SPX3000 also sports two 0.9L detergent tanks so you can store two different types of detergents at one time. One downside though, is that the SPX3000’s plastic parts are prone to leakage. However, just swap out these parts for their brass counterparts, and you’ll have an incredible electric pressure washer on your hands! Also, a cord reel will always be welcome! Also gaining full 5 out of 5 marks is the AR Blue Clean with model number AR383. Despite sporting a somewhat lower spraying power (at 1900 PSI) when you compare it to the SPX3000, the AR383 features other strengths, some not present on the Sun Joe, that propel this washer to the top. Instead of interchangeable nozzles, the AR383 comes with two high-pressure quick-change wands. One wand will be useful for tasks where you’ll need an adjustable spray, while the other wand (Turbo) will be ideal for tasks the need the highest pressure. 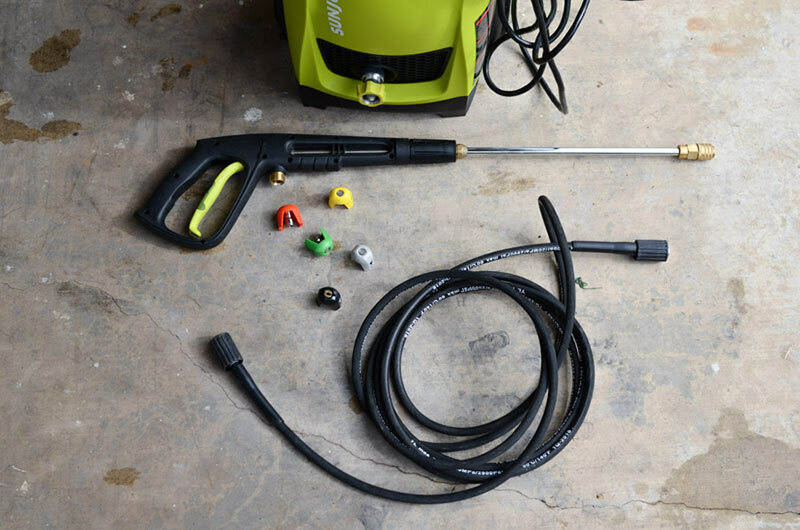 Moreover, the AR383 is very easy to use and will not be a problem for those who are assembling and using a pressure washer for the first time. Similar to the SPX3000, the AR383 features a Total Stop System which conserves energy and water. However, the AR383 also comes with a convenient storage reel for its 20-foot hose. This storage reel makes tidying up after a job well done incredibly easy. Finally, with its price point, the AR383 simply cannot be beaten with its balance of quality, power, and value. The Electric Pressure Washer from Ivation is a decent enough machine that deserves its place on our list. However, it’s relatively low marks speaks for the saying that “more is not necessarily better.” On paper, the Ivation Electric Pressure Washer is the most powerful at 3,960 CU; it’s PSI at 2,200 and a GPM of 1.80. Like the SPX3000, this Ivation product also comes with five nozzles at varying spray angles that are ideal for different surfaces. This product even includes a bonus Turbo wand like the AR383, with the Total Stop System. In fact, you can say that the Ivation Electric Pressure Washer presents the best of both the SPX300 and the AR383! However, with the Ivation’s many strengths, the plastic build, and so-so body constructions let this otherwise excellent pressure washer down several points. 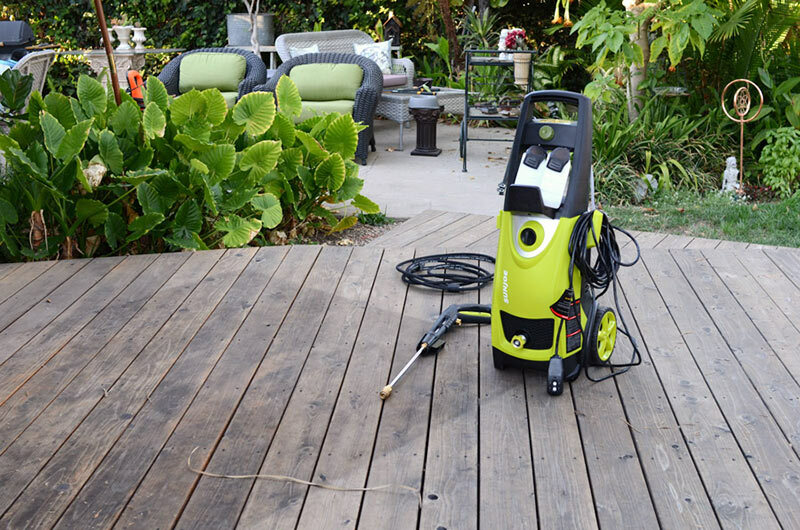 If you’re in need of the occasional cleaning and washing that needs a powerful spray, then the Ivation Electric pressure washer will certainly deliver. However, you shouldn’t expect it to last as long as our other options. The AR Blue Clean AR118 seems to be the runt of our litter if not the baby brother of the AR383. However, with size and power (at 2,370 CU: 1,500 PSI x 1.58 GPM) aside, the AR118 shines in many other aspects. First, the AR118 is incredibly easy to use especially considering its weight and compact frame. It has all the necessary attachments that you would expect from a pressure washer, although the majority will be a separate purchase. Additionally, what the AR118 may lack in power, it makes up for in its almost absent noise. Again, due to its weight, even those with apprehensions using big and bulky pressure washers will find the AR118 a joy to use. If you’re cleaning and spraying tasks require minimal and light-duty work inside or out, the AR118 will be the pressure washer you’ll need and cherish. In comparison to the smaller AR118, you can expect the polar opposite from its bigger cousin: the AR390SS. 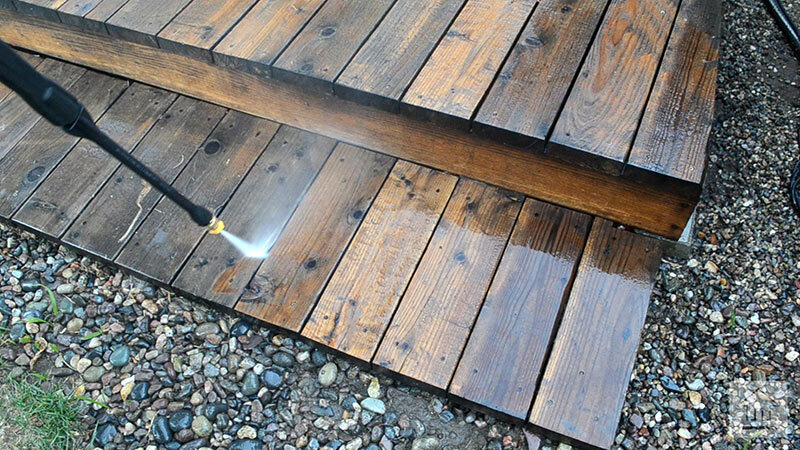 At 2000 PSI and 1.40 GPM, you can say a quick and enthusiastic goodbye to the mold, grime, and mildew in your yard, patio, or garden. The AR390SS comes with 30-foot hose, a cord reel, a 48oz detergent tank, as well as four differently-colored nozzles. The default nozzle sports a rotary/turbo feature; the green nozzle for a wide spray; Red for a concentrated high-pressure spray; and lastly the black nozzle for a low-pressure soap spray. Lastly, you’ll have 35-feet of electric cord for maximum mobility in most garden settings! If you’re willing to spend a little extra, the AR390SS is a worthy upgrade to its smaller siblings, the AR118 and the AR383. Finally, we have the Force 2000 from Powerhouse International with its 13-amp motor and ample spray power at 3,200 CU (2000 PSI x 1.60 GPM). The Force 2000 does stay true to its name with its robust spraying strength with an initial power burst of 3000 PSI ensuring you get all those stubborn stains and dirt build-up! In addition to its spraying prowess, the Force 2000 features an integrated hose reel complete with a hand crank for easy use. These features will make sure you quickly roll the 30-feet of hose that the Powerhouse International utilizes. Inside this fantastic machine is a thermal sensor which effectively keeps tabs on its operating temperature. This feature ensures that your washer never overheats! Another unique feature is the pre-included spinning patio cleaner which will be perfect for cleaning concrete and pavement!